Wash and drain green lentils and pour into a sauce pan. Add a dash of red wine and three times the amount of water. Let simmer until all water is absorbed and lentils are soft. Season with some salt and pepper. Wash broccolini and cut into 3cm long pieces. In a frying pan, heat some olive oil and add chopped onion. Sauté until translucent. Add broccolini and cover frying pan. Add sea salt and smoked paprika. Let cook for about 10 minutes until broccolini starts to soften. Make sure to check frequently so that broccolini does not get burnt. Mix lentils with broccolini and scoop into the pumpkin halves. Top with some pomegranate seeds. 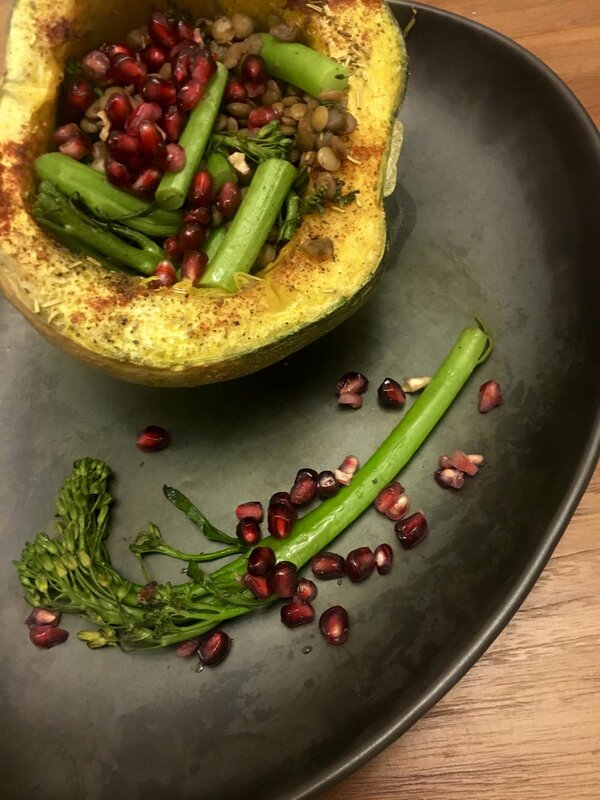 I came across the idea to use half a pumpkin as a bowl for my lentils when scrolling through Instagram (I can't remember which account it was) and thought this was a genius idea. Not only does it add color to your plate, it is also a wonderful way to surprise your guests. I've already written in earlier recipes what an amazing food lentils are. To give you an overview I've created a little infographic. Since a couple of weeks I'm using opentaste.sg to order fresh vegetables and fruits and when scanning their products I saw broccolini - I do like broccoli, but I looooove broccolini so I had to order them. It turns out that they perfectly fit with lentils and pumpkin and even add an additional color to the dish. Broccolini is basically a hybrid of broccoli and gai lan which makes their floretts smaller and their stalks longer. You can eat the whole thing, so no need to through away the stalks. It's also the prefect Christmas dish with its green and red colors. The pomegranate seeds add a crunchy texture and the sweetness goes very well with the light bitterness of the broccolinis. Hope you enjoy this little festive treat. Burger and Fries - Why not? Most of us love burgers with fries, it gives us some kind of childhood memory and we feel comfort when taking a big bite. Unfortunately most of the burgers are loaded with trans-fats, saturated fats and empty calories. So why not try this vegetarian alternative, which provides you lots of iron and fiber but still satisfies your craving. I'm pretty sure also your kids will love it. For the bread, mix all ingredients in a bowl and knead until you get a soft dough. Form four little buns and cross each of them with a knife. Bake for approximately 30 minutes. Check if bread sounds hollow when knocking at the bottom side. For the sweet potato fries, peel sweet potato and cut in finger shape pieces. Mix with olive oil, salt and rosemary and bake at 180 Celsius for 30 minutes until golden brown. Mix chia seeds with water and stir. Set a side to let soak. In a bowl, mash cooked lentils, add garlic, basil, paprika powder, tomato paste, chia seeds and onion. Taste whether some salt is necessary. Cut bread rolls open, add some lettuce, natural yogurt, hummus or any other garnish you like and put patty inside. Serve with oven baked sweet potatoes. TIP: To make the sweet potato crunchier, soak them in water for 40 minutes and dry thoroughly. This removes part of the starch and makes them crunchier when baking. If you plan to meal prep you don't want to overburdern yourself with too much work. Therefore you should opt for an easy but filling lunch option where the different ingredients can be prepared and cooked at the same time. This quinoa pumpkin bowl with cottage cheese and pomegranate is the perfect meal prep dish. Place cooked quinoa in a bowl and top with pumpkin, avocado, cottage cheese and pomegranate seeds. Let yourself emerge on a journey to the middle east with this delicious hummus recipe. Not only are chickpeas a great source of protein, they are also high in fibre to stabilise your blood sugar levels. You can use them as spread on whole grain bread or as I did on toasted sweet potatoes, or you just dip your raw vegetables in it. Soba noodles are a great gluten free alternative to the Western Spaghetti. They are made with buckwheat flour and have a nutty taste. When buying Soba noodles read carefully the ingredients list - most of the producers replace a big quantity of the buckwheat flour with wheat. Here in Singapore I can recommend to order Eden Foods selected buckwheat Soba noddles from iherb. This recipe combines the Asian flavors from Soba and ginger with the Western vegetables. It is perfect for a light lunch and provides you with complex carbohydrates and filling proteins. If you are looking for a nice change to all those quinoa salads, millet might do the trick. It is also gluten-free and high in fiber and antioxidants. Even regarding protein content, millet does well. With almost 3g per 100g it lies just behind quinoa with 3.5g. So what are you waiting for - get the millet cooking. As an Austrian my mother used to make Kaiserschmarrn with lots of sugar and topped with even more jam and cream. So I thought why not try to get a protein packed, sugar free version of this traditional Austrian dish. I found a great recipe on justget.fit It's still rather high in calories, so I'd recommend to have it for breakfast instead of dessert. If you prefer to have pancakes - just add the batter in small portions and fry until you get some small bubbles in the middle. I once talked to a chef about risotto and he explained me that they add at least 250g butter per person!!! WOOOOW, that's a lot of saturated fat I thought to myself - so I came up with a much lighter version which is packed with proteins. Biological value (BV) describes how much of our food’s protein in incorporated in your body’s protein synthesis. There are 9 essential amino acids (smallest unit of protein) meaning that our body can’t synthesize them. A complete protein source contains all of those 9 amino acids. As most animal products are considered complete proteins some vegetarians/vegans might find it difficult to get their amino acids. But there are certain vegetarian food combinations, which lead to a complete protein when eaten together. One good example is eggs plus (sweet) potato. Zoodles are spiralized zucchini and can replace spaghetti for a low calorie/carb meal. For some people portion sizes are an important detail when it comes to losing weight. They are afraid of not getting enough food on the plate. Zoodles allow you to fill your bowl brimful and they give you a satisfying feeling after your meal. There are several kind of spiralizers - I don't have any specific brand I could recommend but find some inspiration below. Add cream cheese to mushrooms and simmer until cheese is melted. Add Salt & pepper. Buckwheat and quinoa are great gluten-free grains which can be used instead of rice, potatoes or pasta. They are high in fiber which keeps your blood sugar level balanced and prevents you from cravings. This casserole dish is great for a family dinner as it can be prepared in big portions. Or you just take the left-overs with you to the office. Place cooked buckwheat/quinoa in casserole, cover with vegetables and feta crumbles. Most people have a negative position towards pasta. Pasta makes you fat, pasta has too many carbohydrates etc. Let me tell you - all bull***! This meal includes complex carbohydrates providing whole meal pasta and in combination with protein rich chickpeas it is the perfect lunch to bring to your office.